Zero-knowledge proofs were introduced in 1985, in a paper by Goldwasser, Micali and Rackoff (). Their practical significance was soon demonstrated in the work of Fiat and Shamir (), who turned zero-knowledge proofs of quadratic residuosity into efficient means of establishing user identities. Still, as is almost always the case in public-key cryptography, the Fiat-Shamir scheme relied on arithmetic operations on large numbers. 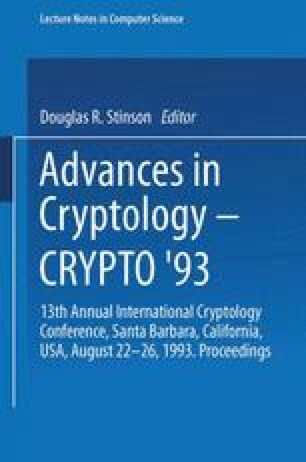 In 1989, there were two attempts to build identification protocols that only use simple operations (see [11,10]). One appeared in the EUROCRYPT proceedings and relies on the intractability of some coding problems, the other was presented at the CRYPTO rump session and depends on the so-called Permuted Kernel problem (PKP). Unfortunately, the first of the schemes was not really practical. In the present paper, we propose a new identification scheme, based on error-correcting codes, which is zero-knowledge and is of practical value. Furthermore, we describe several variants, including one which has an identity based character. The security of our scheme depends on the hardness of decoding a word of given syndrome w.r.t. some binary linear error-correcting code.